Heat from the most enormous open fire I've ever seen warmed me as I sunk into a luxuriously comfortable chair, and tucked into the packet of exquisite chocolate biscuits that had been left to welcome me at the stunning four-star Les Manoirs de Tourgéville. Only a few hours ago, the hustle and bustle of London was having its usual draining effect on me, but here I felt a world away – enshrouded by a peace and tranquillity that I'd almost forgotten existed. That's the beauty of this hotel and certainly its USP. 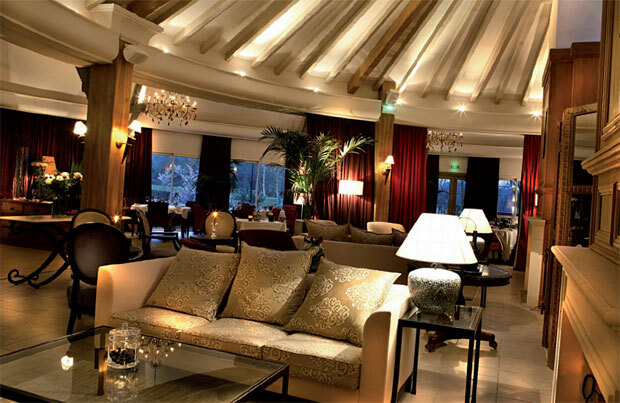 The interior is welcoming and warm, with paintings of horses reflecting the equine heritage of the region. The décor features designer furniture, with overtones of beige grey, taupe, pink and red fabrics by Pierre Frey, Mayenne Canvas and Manuel Canovas. My suite was sprawled across three floors with the fireplace being a focal point of the living area while the private terrace, which offered stunning views over the seven hectares of parkland, was another reminder that this countryside retreat offers perfect serenity and relaxation. After a nap on the giant bed and a dip in the pool, it was time to see what was on offer at the on-site Restaurant 1899. 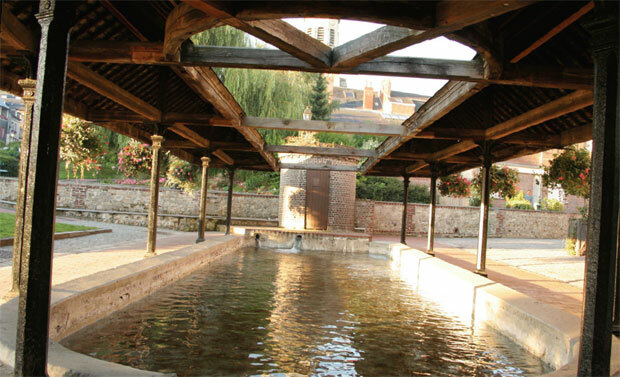 The circle-shaped eatery, named after the birth year of creator of Les Manoirs Sylvain Floirat, overlooks a lush landscaped park, perfect for candlelit romantic meals in colder months and ideal for al fresco dining in the summer. Head chef Emmanuel Andrieu, who was trained by Vincent Maillard at the world-famous Byblos Hotel, didn't disappoint, serving up inspired Normandy specialities that would please the palette of the most discerning foodie. For me it was duck foie gras with cider jelly and gingerbread to start, followed by sautéed sole meunière and then a mouth-wateringly perfect chocolate and hazelnut sphere. Calvados is the signature tipple for the region and a glass of it, along with the warming atmosphere created by more open fires in the cosy bar area, made for the perfect end to an amazingly relaxing day. I woke in the morning amidst a sea of comfortable pillows and made my way to breakfast. 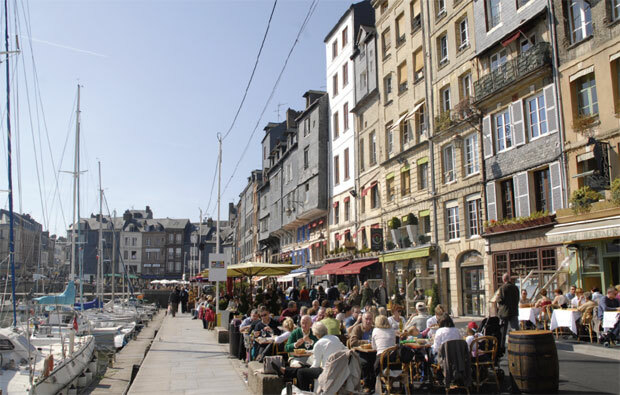 Croissants, pastries, meats and cheeses accompanied by freshly squeezed orange juice were the perfect fuel for a day exploring the nearby harbour town of Honfleur. Proud of its history as a maritime port, the area is one of the most visited in France, and with its authentic charm, cobbled streets and monuments, as well as its cultural and artistic heritage, it's not hard to see why. The pretty harbour sits on the Seine Estuary and has inspired painters and artists for many years, including Claude Monet, who spent much of his time in the town and marvelled at its pastel skies and unusual light. Cute cafés, timber houses and little gift shops make the area all the more endearing while the nearby wooden church of Saint Catherine of Alexandria is a sight to behold. One six-course meal, (and a few obligatory glasses of Calvados) in Restaurant 1899 later, we visited Deauville, popular among the rich and famous for its luxury boutiques and the buzz that it offers in abundance. Coco Chanel made the decision to open her first boutique here and as the closest seaside resort to Paris, the city has long been the go-to spot for the French upper classes looking for some R&R. More than ever, A-list celebrities descend on the area for the American Film Festival which takes place every September. Its beach is postcard beautiful and stretches for miles, while huts dedicated to film stars of the past and present adorn the promenade – the inviting and intoxicating feel of Old Hollywood glamour is inescapable. On top of countless bars, cafés and restaurants, the city is home to Deauville La Touques Racecourse and is known throughout the world for its prestigious and enviable equine reputation – watching the horses galloping across the beach in the early morning is a beautiful way to start the day. Those fancying a flutter can enjoy the thrill of pounding hooves on race day and finish up at the Casino Barrière later to make (or break) their fortune, while couples looking for something less risqué can enjoy a lazy stroll around the city's markets or explore the nooks and crannies that point to its colourful history. Deauville has long been associated with love stories and is mentioned in the Great Gatsby as the honeymoon destination for Tom and Daisy Buchanan. This visit was certainly the first chapter in my love affair with beautiful Normandy. 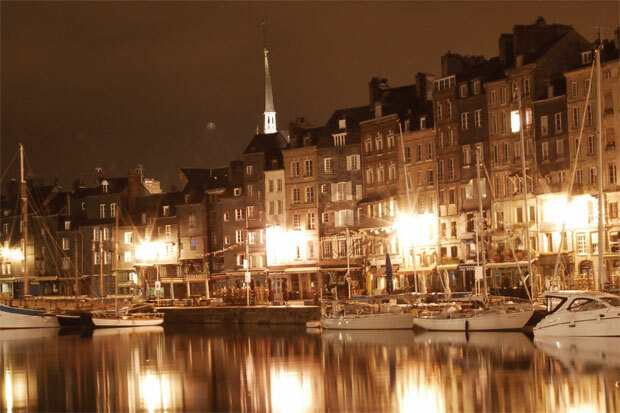 Honfleur Tourist Board | www.ot-honfleur.fr. 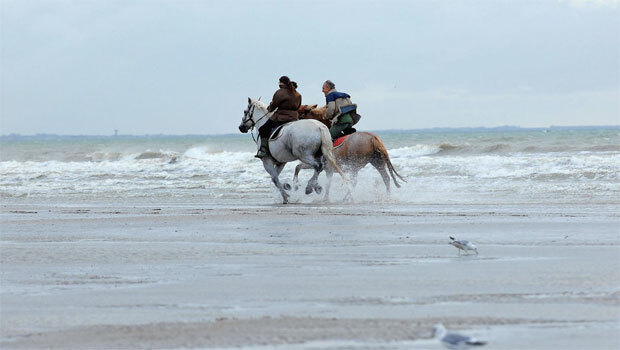 Getting to Deauville is easy! Take the Eurostar to Paris Gare du Nord then a two hour train ride from Paris Saint-Lazare. In the summer Ryanair fly direct from London Stansted to Deauville airport.